Your financial support, along with the work you do each and every day, helps continue our mission of providing the best education and overall experience for our students. Each of us can take pride in the growth and accomplishments we’ve experienced over the past few years, and rest assured that as we change, the best of who we are will remain constant. Your participation inspires others to make a gift – and instills confidence from funding sources outside the university, such as foundations and corporations. When we invest in our university and students, others follow suit. 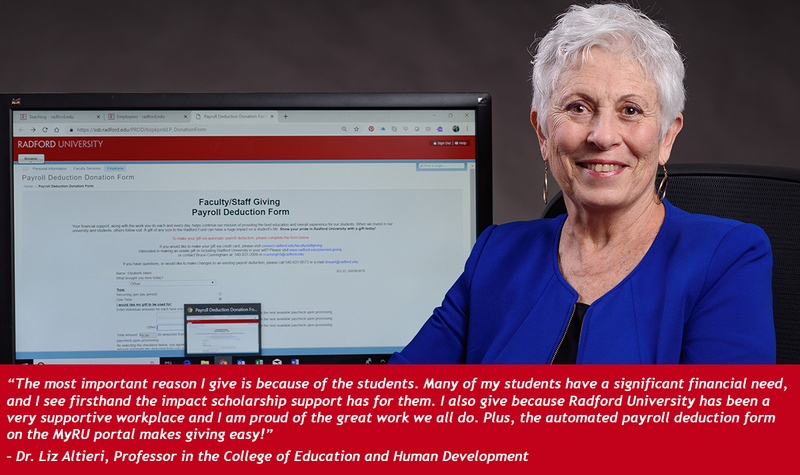 A gift of any size to the Radford Fund can have a huge impact on a student’s life. Show your pride in Radford University with a gift today! To make your gift by credit card, please complete the form below. To enroll in automatic payroll deduction to make your gift, please log into your MyRU portal and visit the “Employee Tools” section. Interested in making an estate gift or including Radford University in your will? Please visit www.radford.edu/planned-giving or contact Bruce Cunningham at 540-831-2009 or rcunningh5@radford.edu.